First, our Youth Advisory Council began discussing how we could introduce new foods to students to encourage them to try new things. This idea of challenging people to try new things paired with a little bit of fear from not knowing what the food was mimicked “Fear Factor” type situations that the students had seen before. All of the details for the event are planned out by students in Youth Advisory Council and the adult’s support their efforts by making it happen. The students make a 1 minute video encouraging kids to sign up during their physical education class. One student would be chosen to represent each grade level in the Fear Factor Show. Our Principal, Assistant Principal, classroom teachers and support staff have been individually invited to participate so we have a total of 10 participants. Students are chosen and all health records along with verbal consent from parents must be checked before they are officially the grade level contestant. Next, the students begin sharing ideas of different foods students should try. Our group usually has homework to come with a unique food they found at the grocery store with their family. Past foods have included Asian pears, pickled okra, sea weed, quinoa, coconut milk, and sweet potatoes. Then the research begins on preparation, nutritional values and main place grown. The preparation of the food has changed each year from handing out a piece of the food to blending up the food into a liquid to drink. This research is the educational piece that the students will present during the event. We are lucky enough to present our Fear Factor as a whole school assembly (630 students). 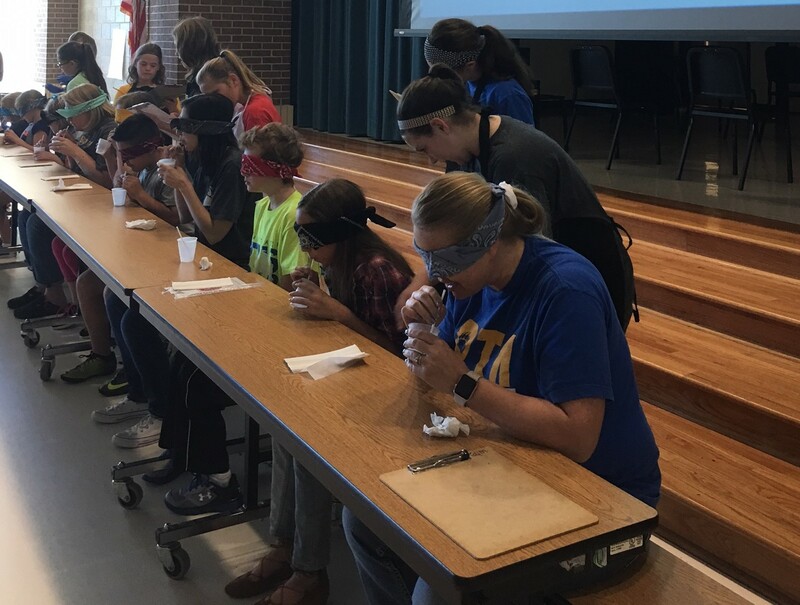 The contestants and teachers are blindfolded at tables in the front of the assembly. They are all presented a food in small cups, one at a time. The students enjoy using a point system to help determine a winner of the event. You receive 1 point if you simply taste the food, 2 points if you eat half of the food, and 3 points if you eat it all. Each food is announced after the tasting period is over. Finally, the food is announced. The students project a picture of the food and give a brief description of the food and interesting facts. The winner of the event receives a prize to help them with their own food preparation in the future. Past prizes have been a blender, baking pans, kitchen utensils, and mixing bowls. Our Child Nutrition Manager makes this event run smoothly. She helps the students prepare all of the food including ordering the small cups and providing the prep space. It is very possible to host an event but food prep would be a factor to consider when planning. The event its self takes a number of people to run including judges, food staff to bring and clear all of the food, and announcers. For us this has been a great opportunity for the students to lead. Fear Factor is a school wide event that will continue past our three years commitment to Healthy Zone. This one event will help us sustain the healthy environment we have been working to achieve since our doors opened in 2014. It has become a part of who we are, always growing and exploring new healthy foods. Stevenson students and staff have no fear when it comes to new foods!